We did not get much done, but it was really fun just to be together and run errands, take naps, have neighborhood parties, etc., together. Fun times had by all. 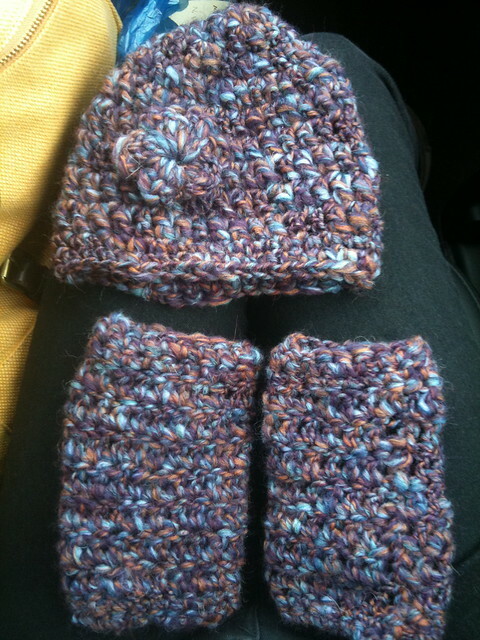 My sister in law asked if I would make her a present for a friend of hers that is having a birthday and, since she is two, we decided on matching hat and leg warmers. I really love the way they turned out and think I am going to add leg warmers to the shop. And maybe some adult ones. I also made a lot of adult hats that I will add to the shop tomorrow when its not so late and I actually have had a shower and can maybe photograph myself in it without looking like a hobo off the streets- its bad people. Am I the only one who wakes up, even if I showered last night, and looks like a crazy person who stuck their finger in a light socket before I got up??? Dont answer that. Ok. I am off to watch every fashion show show about last night because I did not see anything really, as my kids were running around like crazy at my in laws house....and is everyone even watching the bachelor? I just cant get into it...is fang girl still on there? Ok, really going to crochet while watching tv while reading a magazine. Fang Girl decided to leave last night so it is safe to watch again haha. Love all your recent crafts and that you are now on Etsy! Kristen, I love reading your posts because I can hear you saying everything you write... haha does that make sense? It's like you're just having a conversation with us. :) Anyway, loving all your etsy stuff!